Product #20882 | SKU DCB306 | 0.0 (no ratings yet) Thanks for your rating! The black DCB-306 SLR Camera Holster from Case Logic makes shooting quick and easy with its sleek, lightweight and functional design. It holds your DSLR with kit lens, face down, in shooting position. The lid of the holster opens away from your body creating a faster, quick access way to retrieve your camera. This design also provides an extra level of security since when the lid is opened, only you will be able to see what's inside. You'll find this works well when you're in the middle of a crowd. The textured nylon material is durable and padded to deliver solid protection to your gear. Even the bottom of the holster has been bolstered with extra padding in case you place the bag on a table or the ground. The carry handle is also padded for maximum comfort. For storage, there's an interior zippered pocket located in the lid for memory cards, filter or cleaning cloth. 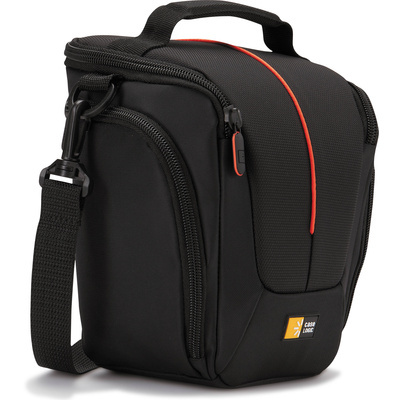 Outside, two zippered side pockets can hold cables, extra batteries and other small items such as a lens cap. The holster comes with an adjustable, removable shoulder strap, top carry handle and very convenient belt loop that will leave you hands-free to pursue your photography, make a phone call or grab a snack. At only 12 oz, this holster offers protection, rapid access and an excellent price point. It's backed by Case Logic's 25-year warranty.